The awesome feeding whales are real, the boat was added. 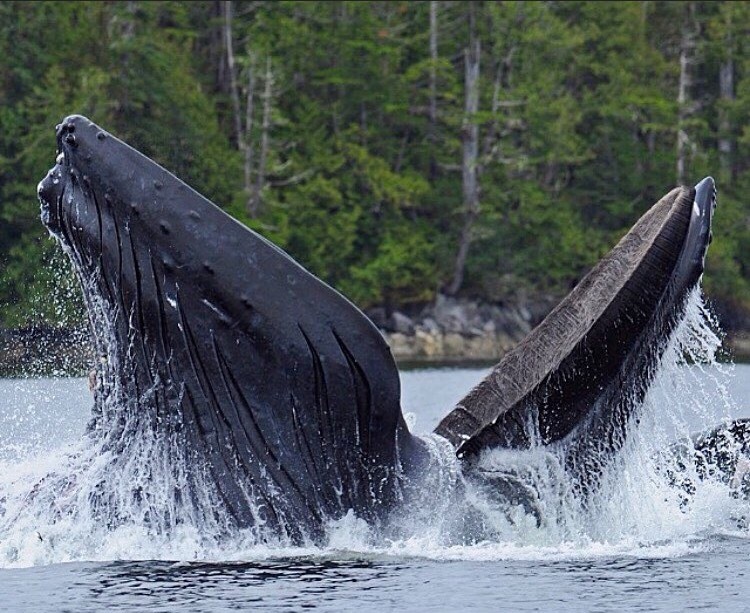 Whales are plenty amazing without photoshop fakery. I found the original image and made the animated gif to help keep reality real. It’s fun to see exactly what was added when you do one of these. Today I really got into whale watching on line. Whale feeding is quite interesting. 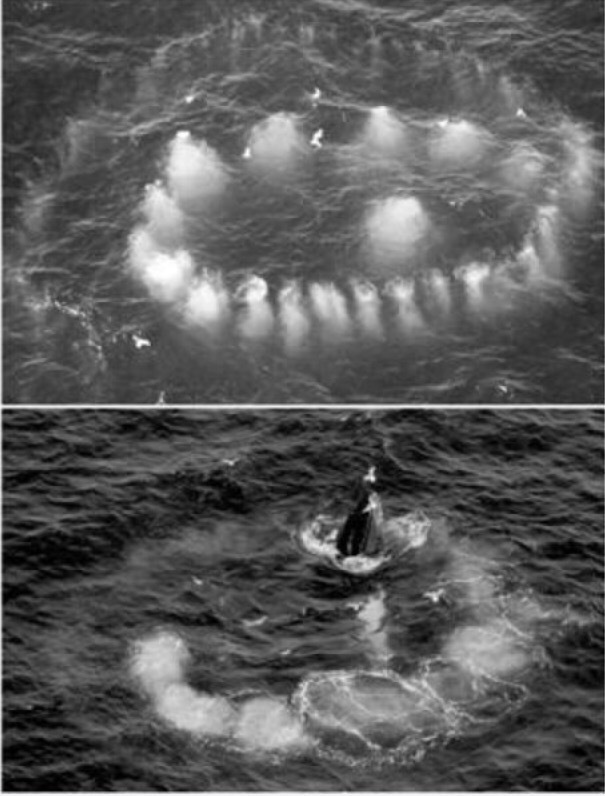 Humpbacks can create nets of bubbles to capture food, for example. 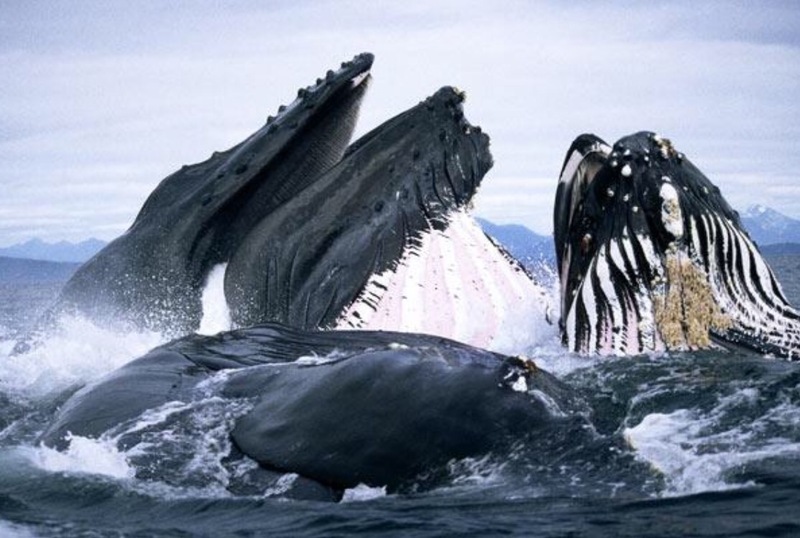 Humpback whales (Megaptera novaeangliae) are large baleen whales (up to 14 m long) that feed on a small prey in dense concentrations, such as krill or herrings. 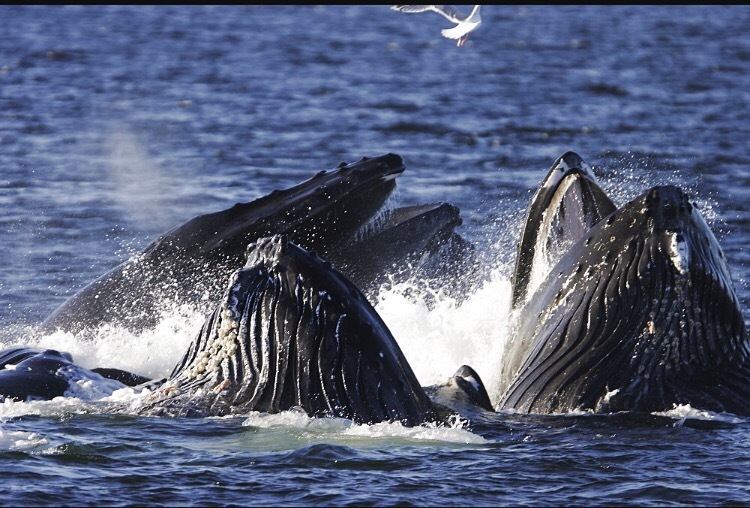 Humpbacks whales have large flukes relative to their size providing greater thrust for quick maneuvers. 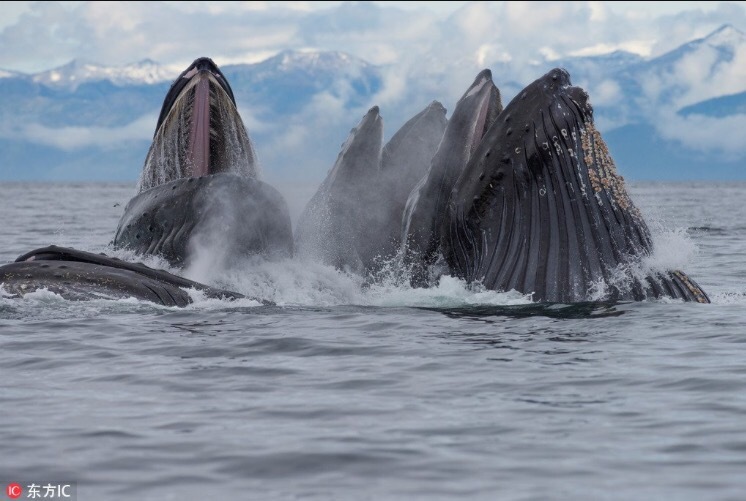 While other baleen whales feed by swimming rapidly forward, humpbacks are adapted for fine-scale movement to create bubble nets. 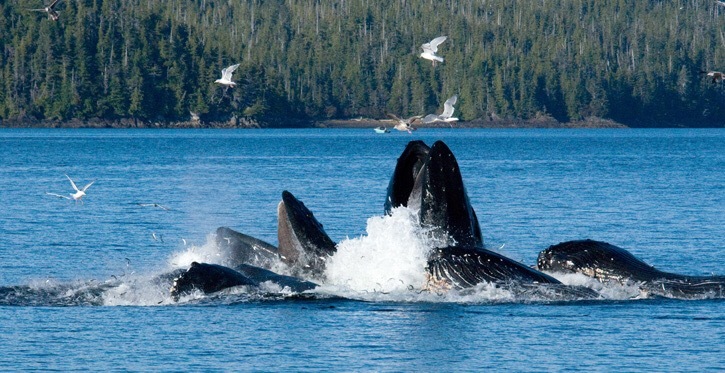 Behaviorally, humpback whales capture prey by engaging in complex feeding maneuvers that are often accompanied by the apparently directed use of air bubble clouds (the production of single or multiple bursts of seltzer-sized bubbles) to corral or herd fish. These whales create bubble nets to corral and contain planktonic prey into a small area so that they can more efficiently scoop them up in their large filter-feeding mouths. Based on surface observations, these bubble-feeding behaviors appear to vary in nature among both individuals and regions. … The data revealed the release of bubbles while swimming in upward spirals and during a novel behavior called “double-loops” not previously known. Double-loops consist of one upward spiral to corral the prey, a smack of the fluke on the ocean surface (known as a “lobtail”) then a second upward lunge to capture the corralled prey. This sequence of tools and targeting of prey seems as complex as the tool use of apes in the forest. 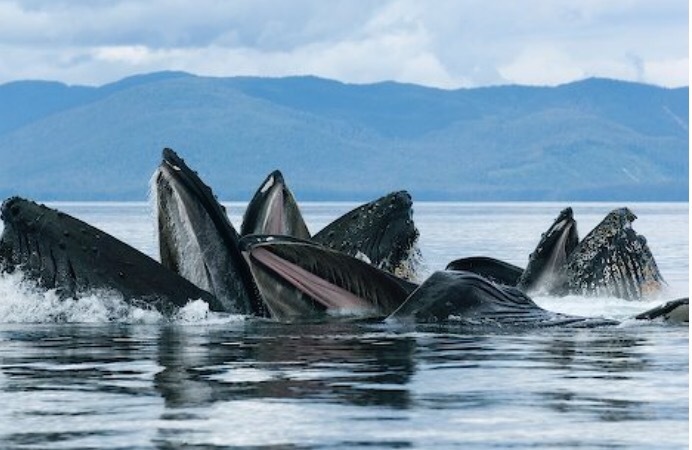 The study also reports that humpback whales work in teams of at least two individuals and are not beyond robbing the prey from the bubble nets set up by others. 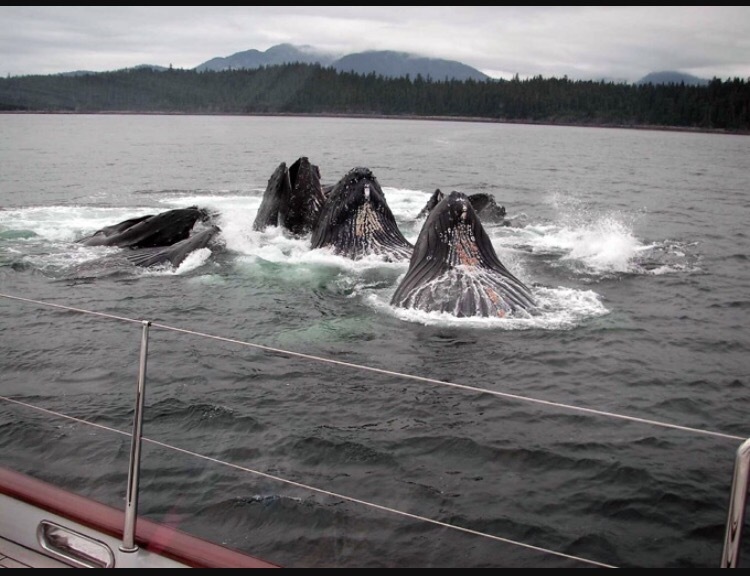 What you are seeing may be “group bubble netting” by Northern Pacific humpback whales … plus a small fishing boat from who knows where. This is my PHOTOSHOPPED image. Someone took my name off of it. I did it for fun and took two photos and combined them. The (other photographer) grabbed it from a mutual “friend.” The scale is rediculous and was funny to me, so I made it. It is actually my first PS composite I ever made. Given the viral nature of this image, maybe I should make some more and do a cleaner job. Yes, it likely would go more viral… but consider our collective predicament: When online positive attention translates to sales or other types of profit, attention will become more important than truth. If we believe things that are untrue, we make bad decisions, some of which are could eventually doom the human race. Then again, it may be too late. Perhaps we are already in the simulation that was necessary because we lost reality. Like fools, we let our planet die and we had to put ourselves in this computer generated universe floating through endless empty space. We may not even exist. 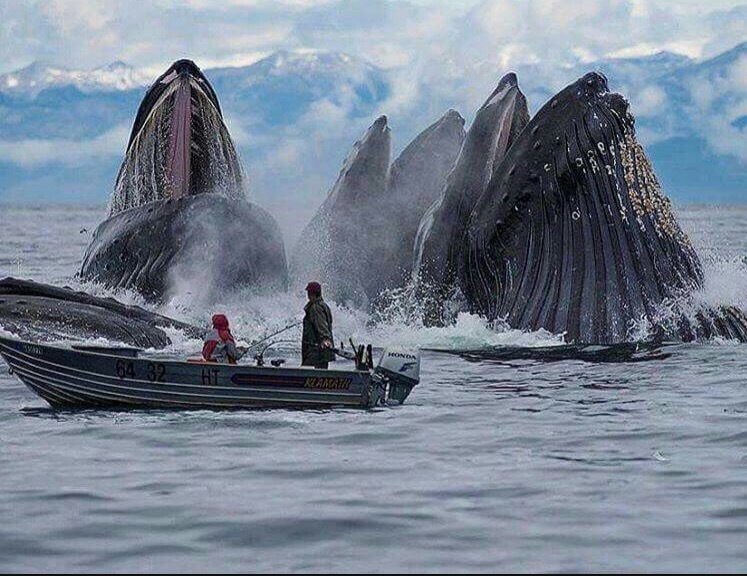 This hoaxed whale boat photo may be just a little reminder of that. Nothing we can do about it, I suppose. Real or not, I’d like to see those whales in person some day. I’ll go out there in a little boat. It could happen. More so in a simulation than in a real universe, anything is possible. « Illusions: Which Order Tells the Story Best? One generally finds most of the material internationally distributed by the notorious global photo journalism service Getty images to be in fact photo shopped and manipulated. Having watched a person close to me, who was a photographer for Getty, take and submit stock photos, I can confirm that they have to meet certain criteria and photoshop / lightroom is used for that. Too much saturation would get photos rejected, I’m pretty sure, however, because that’s one of the things she told me were making my nature photos seem amateurish. I like to boost the green in the trees at times, and who doesn’t enjoy a bluer sky? Indeed, a blue sky is always preferable to a gray one. Yes, I’ve seen things like the moon made bigger, etc.